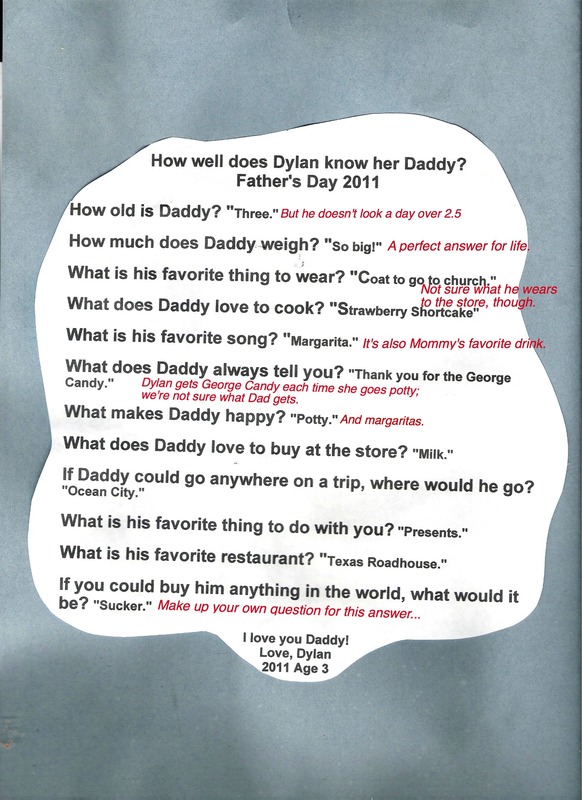 Last year, when Dylan was three, her nanny asked her questions about her daddy and recorded her answers. With Andy’s permission, we’ve annotated Dylan’s responses. One thing is for sure: Dylan loves her Daddy. Special thanks to Andy of Our Life in 3D for submitting this. He and Dylan’s Mommy have an entertaining daughter! With both Mother’s and Father’s Day coming up, why not have your child fill in a questionnaire and send us the humorous results? Email us at stuffkidswrite(at)gmail.com. Posted on March 13, 2012, in For Dads and tagged Chase McFadden, Father's Day, funny kids writing, Leanne Shirtliffe, Our Life in 3D, parenting, Stuff Kids Write. Bookmark the permalink. 5 Comments. Dylan’s Daddy’s restaurant Texas Roadhouse is a good choice and I love strawberry shortcake! I’m impressed that they have Texas Roadhouse in Calgary. Thanks for the shout out Leanne! It looks great and I appreciate you giving it a post. I also thought the idea of doing the same for Mothers day and Fathers day coming up was genius. If it is OK I want to reblog this to my home. Thanks again! This was a cute Fathers day gift last year from my oldest daughter and reprinted at Ironic Mom’s site, Stuff Kids Write”. It was cute to me, as I understand the reasons behind the answers. She is basically answering for herself and some of the things we shared together. 4) It was the beginning of summer and I made this every week. And she loved it! 9) We were making vacation plans to take her to the boardwalk at Ocean City, NJ that summer. I showed her the videos on youtube. 10) Dylan is the one that likes presents. I like ‘rest’. 11) Texas Roadhouse was the nearby restaurant we would eat lunch at every Saturday afternoon. They had the BEST manager there that would stop what she was doing and just adopt Dylan and then our youngest too for the afternoon. She took them everywhere…in the kitchen, behind the bar, etc and they would come back with either or both a bowl ful of cherries or marshmallows. Tammy was awesome! 12) Dylan was going through a phase with lollypops, still is. But, if Mom holds up her little pinky finger (wrapped around…) every time Dylan asks for something and I jump the answer works well then also. What were your favorite, most memorable Father’s Day or Mother’s Day gifts?